You only get one chance to take the perfect action shot The GoPro camera has taken the market by storm. Durable andweatherproof, these cameras are tailor-made for athletes,filmmakers, journalists, and hobbyists who want a hands-freedevice. 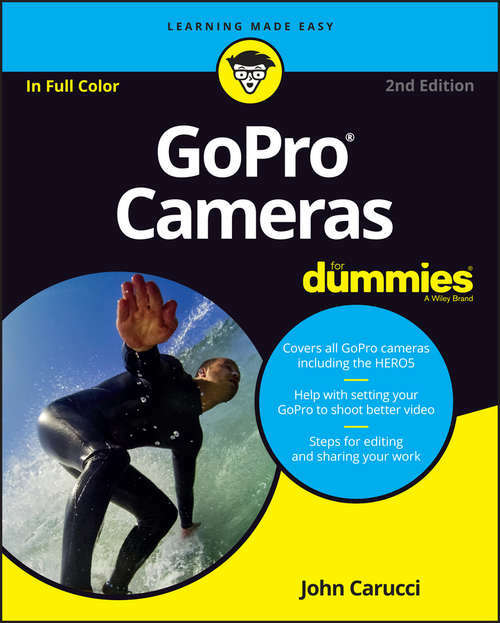 Whether you're BASE-jumping, mountain biking, surfing, orjust shooting the next big indie masterpiece, GoPro Cameras ForDummies has you covered with information on how to get the bestphotos and videos from your camera.Jumpstart your GoPro experience, with helpful advice on how tocreate and share action-packed photos and videos. Plus you'll getprofessional insight on how to mount, set, and control your camerafor best results no matter the shooting conditions, and how toedit, add music, and share your finished piece. Step-by-stepinstructions walk you through each process, helping you getacquainted with the GoPro's controls and settings until you'reconsistently getting great footage. This helpful guide is packedwith full-color, full-page examples of GoPro photos from top users,to inspire you to get the most from your new camera.Choose the right camera and add the right accessoriesMaster the settings for any environmentEstablish framing, work with lighting, and capture soundEdit your images, and put them together as a projectRather than risk bad results with the school of trial by error,master your camera with the help of a professional photographer andvideographer. The best action shots can't be re-created, so knowwhat you're doing going in so you can nail that shot the firsttime. If you're ready to get out there and start shooting, grabyour gear and grab GoPro Cameras For Dummies, your personalGoPro coach.